‘What outfit goes well with this pair of shoes?’ To answer this type of questions, one has to go beyond learning visual similarity and learn a visual notion of compatibility across categories. In this paper, we propose a novel learning framework to help answer this type of questions. International Conference on Computer Vision (ICCV), Santiago, Chile, 2015, (*The first two authors contributed equally). With the rapid proliferation of smart mobile devices, users now take millions of photos every day. These include large numbers of clothing and accessory images. We would like to answer questions like ‘What outfit goes well with this pair of shoes?’ To answer these types of questions, one has to go beyond learning visual similarity and learn a visual notion of compatibility across categories. In this paper, we propose a novel learning framework to help answer these types of questions. The main idea of this framework is to learn a feature transformation from images of items into a latent space that expresses compatibility. For the feature transformation, we use a Siamese Convolutional Neural Network (CNN) architecture, where training examples are pairs of items that are either compatible or incompatible. We model compatibility based on co-occurrence in largescale user behavior data; in particular co-purchase data from Amazon.com. To learn cross-category fit, we introduce a strategic method to sample training data, where pairs of items are heterogeneous dyads, i.e., the two elements of a pair belong to different high-level categories. While this approach is applicable to a wide variety of settings, we focus on the representative problem of learning compatible clothing style. 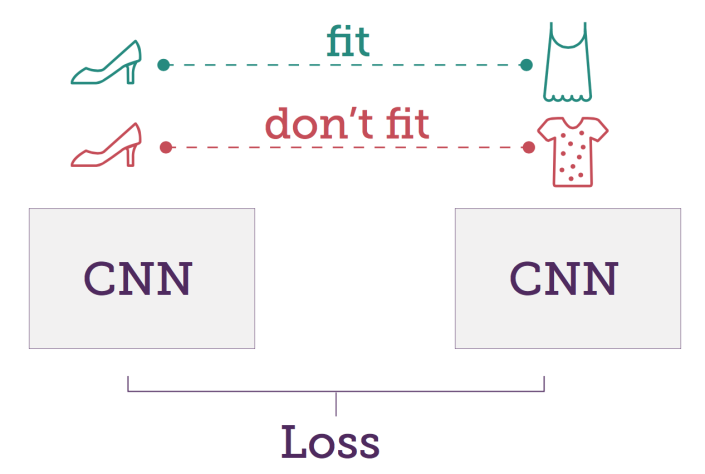 Our results indicate that the proposed framework is capable of learning semantic information about visual style and is able to generate outfits of clothes, with items from different categories, that go well together. We separate the data by nodes (products). The train, validation and test sets are disjunct lists of product ids (“asin” for example, ). We make sure to not consider any links from the dataset where the two products of the link belong to different sets. This ensures that during training the network has never seen the images of products in the validation or test set. We would like to thank Xiying Wang for her assistance that greatly improved the illustrations. We further thank Vlad Niculae, Michael Wilber and Sam Kwak for insightful feedback. This work is partly funded by AOL-Program for Connected Experiences and a Google Focused Research award.